A hundred years can take its toll on infrastructure, and this is often the case with old houses. The water line from the street, electrical wiring, plumbing, mechanical systems—all are often nearing the end of their life. It would be foolish to renovate a house without replacing these basic systems. Windows often no longer function as intended, either. Their ventilation properties are hindered by layers of paint, or they simply became swollen shut years ago. If neglected, siding can need repair or replacement, too. And while the shape, floor plan, and details of an old house allow it to endure, people often think they need an addition to provide another bathroom, bedroom, office, or better views. Then they spend money building an addition, only to spend all their time in this new space because the rest of the house is uncomfortable. They don’t really get more space in this deal; they get a smaller space that’s comfortable. While the cost of fixing wet basements and adding bathrooms can add up quickly, energy upgrades don’t have to put things out of reach. In fact, they don’t really cost that much more because they’re integral to the decisions and choices made in the renovation process. 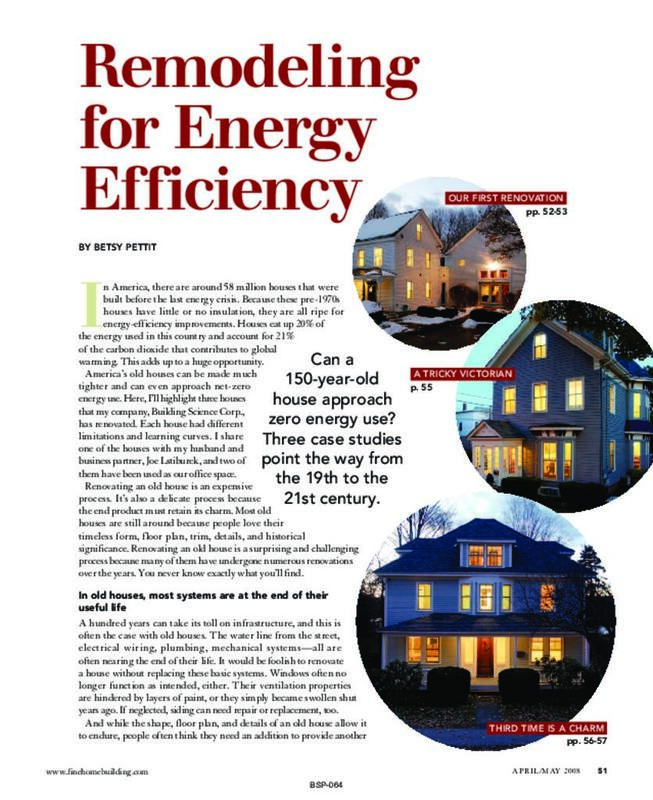 If you consider a renovation as a whole system, you might find that you can add modern conveniences (such as an extra bathroom, bedroom, or office space) and comfort without building an addition, and reduce your energy costs in the process. The basement and attic are already built; you just need to use them. By adding rooms in the basement and attic, you often can reconfigure the floor plan to accommodate an extra bathroom, a larger kitchen, or a master suite. Replacing the furnace, the boiler, or the HVAC system might cost $10,000 before you are done. But the upgrade could easily save $1000 a year in heating and cooling costs. Even in simple payback terms, this new system would pay for itself after ten years. Amortized into a 30-year mortgage, it costs $27 per month; the savings works out to $83 per month for a net gain of $56 per month. Because we know energy costs are rising, these numbers will only get better. The three homes featured here have several things in common. First, they are all more than 90 years old. Two of them were built in 1860 and the third in 1916. Second, they all had their major systems totally replaced: new wiring, light fixtures, plumbing, and mechanical systems, including the addition of central air-conditioning. Third, they all had attic spaces that were incorporated into the living space of the house by moving the insulation from over the second-floor ceiling to under the roof. Fourth, they all had insulation added under a new basement slab, as well as insulation applied to the inside of the exterior foundation wall. Fifth, they all had at least some windows replaced, and all had new window openings added in critical areas to provide better views of the yard and better daylighting to the home. Sixth, all the homes had bathrooms and bedrooms added. Finally, we replaced inefficient window A/C units with central A/C systems in each house. Because of the work in the basements and attics, all the homes had increased living area without increasing the footprint of the home. And while the living space increased by 30% to 100%, all of them saw a reduction of energy use that ranged from 30% to more than 100%. While the renovations cost more than $100 per sq. ft. for each home, all were appraised at values exceeding that cost after the renovation was complete. Some things are different in each case, too. The two oldest homes had major structural issues that needed to be repaired before other work could be done. Foundations needed to be rebuilt, and additional columns and beams were added for support. One house, the Greek revival, had frequent basement flooding that had to be stopped, and its attached barn was leaning enough to fall down. The Victorian was in a historic district, so even though the chimneys were structurally unsound and the old slate roof was beyond its useful service life, they had to be repaired (at a great cost) rather than replaced. Making a flooded basement livable is a great example of how one type of repair is directly related to another. On one of these projects, we needed to stop water from leaking into the old rubble foundation with a perimeter drain and a new slab. Adding insulation under the slab and inside the walls keeps the space free of condensation and also saves energy. The durability and functional upgrades illustrated in this article cost a lot. By spending a little more, we were able to reduce our energy costs tremendously. After cutting energy consumption, the stage is set for affordable site collection of renewable power to offset the remaining energy needs, which could bring these houses to net-zero energy use or even energy producers. . .